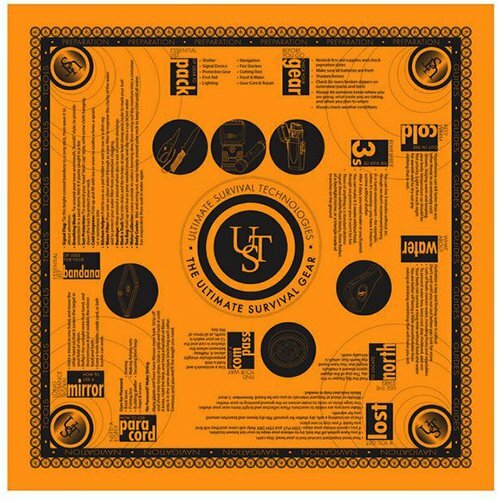 The high-visibility orange UST Survival Bandana can be used as head cover and includes a collection of survival tips on hiking safety, navigation, knots, first aid, and more — ideal for backpacking, hiking, hunting, and emergency preparedness. Durable and washable, it measures 22 inches square. UST Brands has been manufacturing camping, survival, personal safety, and emergency preparedness equipment for over 80 years, including innovative LED lights, all-weather fire starters, premium outdoor cutting tools, camp kitchen products, first aid kits, unbreakable signal mirrors, and more.